The Sensorama Was the First VR Device - Fact or Myth? The Sensorama was the first Virtual Reality device. Was the Sensorama the First Virtual Reality Device? The Sensorama (1962) can be considered the first Virtual Reality device, it was a head-mounted display that played 3D film accompanied by sound, moving air, and aromas to create a virtual sensory environment. This non-computerized precursor to VR was followed by computerized VR / AR as soon as technology allowed. Other important VR firsts include Tom Furness’s work with VR and AR for the Air Force staring in 1966, and Ivan Sutherland’s work on the first head-mounted display (HMD) “The Sword of Damocles” which began in 1966 as well. Below we look at the first important innovations in Virtual Reality, it’s close relative Augmented Reality, and the devices that interact with those technologies. A video about the Sensorama, the world’s first virtual reality device. Morton Heilig prototyped in 1962. 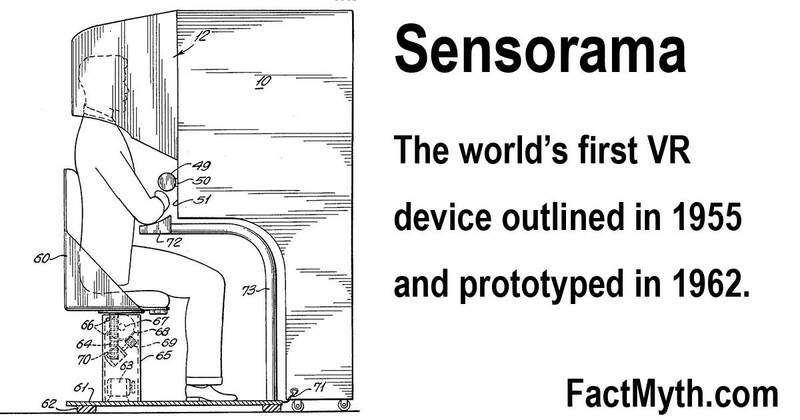 Heilig first envisioned the Sensorama in a 1955 essay. 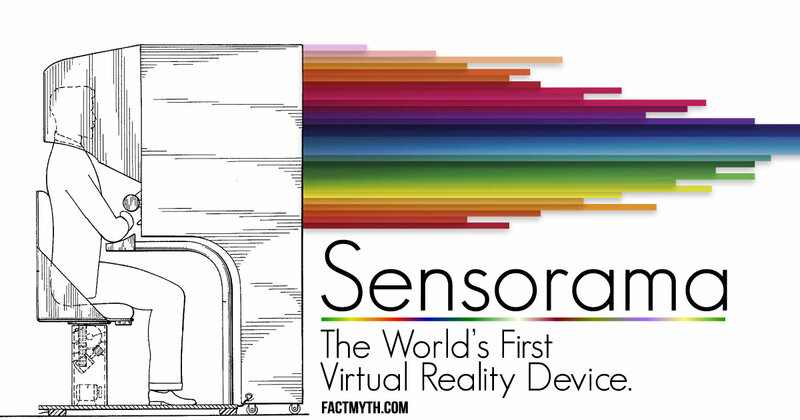 The Sensorama is the first device that meets the definition of Virtual Reality. However, many consider the first true Virtual Reality and Augmented Reality Head-Mounted Display (HMD) device to be “The Sword of Damocles”. “The Sword of Damocles” is more in-line with what we would consider “modern VR”, and importantly unlike the Sensorama, it is computerized. The same year Sutherland began work on the “The Sword of Damocles”, Furness began work on creating Virtual Reality devices for the US Air Force. Both developed computerized VR devices around the same time. All three projects can be seen as “the first VR”. A video showing First Head-mounted display The Sword of Damocles (the project began in 1966 and the device was created in 1968). NOTE: Tom Furness himself credits his work, Ivan Sutherland’s work, and Morton Heilig’s Sensorama as the first Virtual Reality devices. By timeline, the Sensorama comes first (making it the first VR device). This is confirmed in the video above. Tom Furness (Grandfather of AR and VR) – “Being the Future” at AWE 2015. The Sensorama was a device created by Morton Heilig that he detailed in a 1955 paper entitled “The Cinema of the Future”. It was an interactive theater experience that included a headset that could display stereoscopic 3D images in a wide-angle view, provide body tilting, supply stereo sound, and also had tracks for wind and aromas to be triggered during the film. This allowed a user to experience a “4D” representation of the world as they could see a 3D environment and interact with it. FACT: In 2016 when we say Virtual Reality we mean a computerized Head Mounted Display (HMD) with full 3D immersion. But technically, any artificial environment is VR. We can consider the Sensorama to be a good example of the first Virtual Reality and Augment Reality devices despite it not being computerized. How Do We Know the Sensorama was the First VR Device? To show the Sensorama was the first virtual reality device we have to first prove that the Sensorama meets the definition of virtual reality. Virtual reality is an artificial environment that can be interacted with in a seemingly real or physical way by a person using electronic equipment, such as a helmet with a screen inside or gloves fitted with sensors. Definitions typically include in the definition that the environment is “computer-generated” while the Sensorama predates modern computers it should be noted that the Sensorama meets all criteria aside from this. The Sensorama is widely considered a good example of “the first virtual reality device”, but the computerized devices that follow it are where the history of Virtual Reality and Augmented Reality really begins. Mort Heilig was a filmmaker and had the idea for VR before a computer display was an option. Once computer displays start being an option the first “true” virtual reality environments are created by teams led by Thomas A. Furness III and Ivan Sutherland. In 1966, Thomas A. Furness III introduced virtual reality technology to the Air Force. In the same year Ivan Sutherland, with the help of his student Bob Sproull, began working on his “The Sword of Damocles” device. These men and their devices have rich and interesting stories that are featured on the videos on this page. Importantly, Furness went on to work on VR and AR for the Air Force and then for companies he headed for decades. Much of the VR and AR innovation over the years can be traced to him and other pioneers like Steve Mann (the father of wearable computing). Below you can see another innovation by Sutherland below, Sketchpad, an early way to interact with computers. Part of Virtual Reality and Augmented Reality is how you interact with the machine. Ivan Sutherland, an early innovator in computing. If you want a closer look at some other early devices, or want more on the history of VR and AR, check out our history of virtual reality page. The Sensorama was the first non-computerized virtual reality, “The Sword of Damocles” is typically considered to be the first virtual reality and augmented reality (AR) head-mounted display (HMD) system. Despite this Tom Furness’s work could easily be considered true “virtual reality” as well. Sensorama, notably comes first, so it is at least a good starting point for first device. “The sights and scents of the Sensorama Simulator“. Engadget.com. Retrieved Oct 9, 2015. “virtual reality“. Merrium-webster.com. Retrieved Oct 9, 2015. “Virtual Reality: History“. Archive.ncsa.illinois.edu. Retrieved Oct 9, 2015. “Google Cardboard“. Google.com. Retrieved Oct 9, 2015. “Oculus“. Oculus.com. Retrieved Oct 9, 2015.